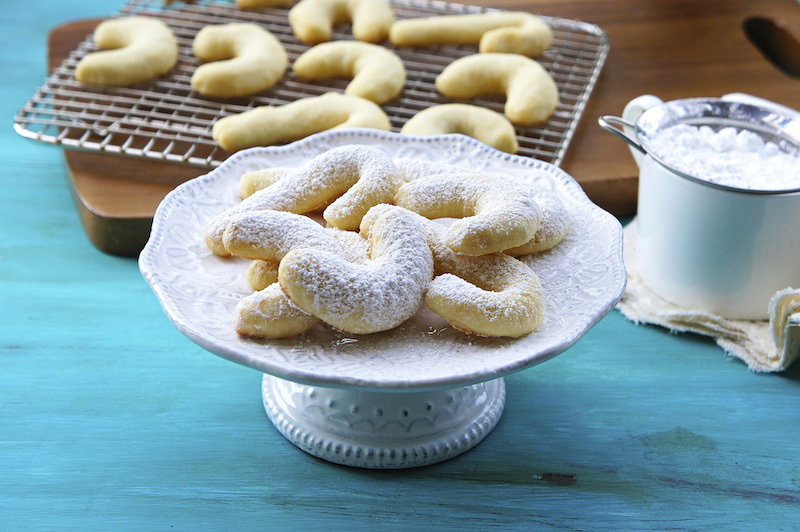 These delicate snow-dusted Lemon Cookies have a wonderful lemon and almond flavor. The cookies are rich, crumbly, and melt in the mouth. They are simple to put together and make a lovely Christmas gift too. Preheat the oven to 350˚F. Line a baking tray with a piece of parchment paper. In a large bowl, using a wooden spoon beat the butter and sugar until soft and creamy. Mix in lemon zest, juice, and ground almonds until well blended. Add the flour, salt, mixing only until it is incorporated into the dough. Pull off a tablespoon of dough and roll with your hand into a short rope, and shape into crescents, or roll into a longer rope and shape into candy canes. Place on the baking tray and bake for about 12 to 14 minutes and transfer the cookies to wire racks and let cool completely. Dust the cookies with some confectioner’s sugar. Store in an airtight container to keep them crisp. Your lemon cookies look beautiful, and I am sure they taste great too!